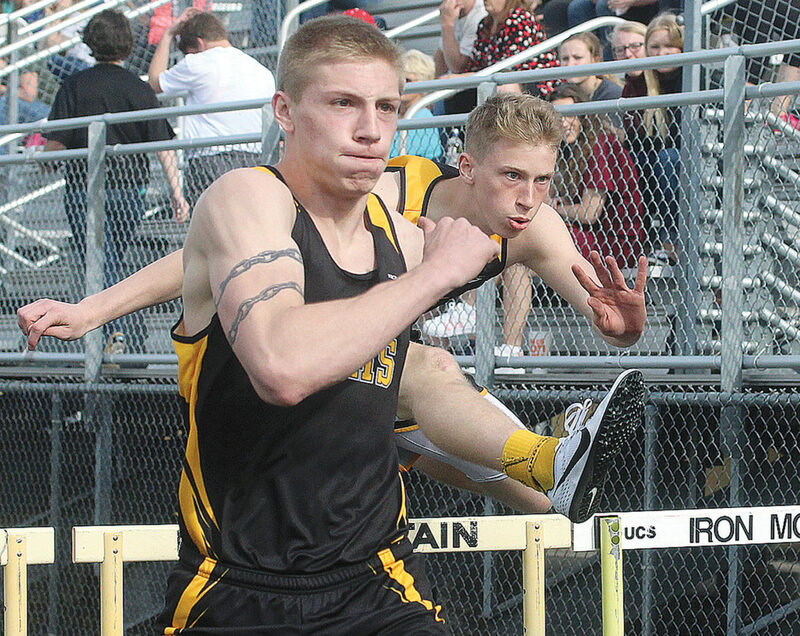 IRON MOUNTAIN — Iron Mountain nipped Negaunee to capture a boys quad track meet Tuesday at Mountaineer Stadium. The Mountaineers tallied 109 points to 105.5 for the Miners. Westwood, 32.5, and Manistique, 9, also participated. “It was a big win for the team and a real confidence builder,” Mountaineers coach Kevin Sullivan said of the home opener. The Mountaineers had two athletes win multiple events with Aaron Bolo taking the 100 hurdles (15.89) and the long jump (personal best 20-0.5) while Charlie Gerhard won the 300 hurdles (45.05) and the high jump. Jake Dumais (400 dash, 55.91) and Nick Callahan (pole vault, 10-0) also earned individual wins for Iron Mountain. The Mountaineers also won the 800 (Christian Margis, Jaden Vicenzi, Adrian Barraza, Jacob Tucker, 1:36.64) and 400 relays (Bolo, Healy, Adrian Barraza, Jacob Tucker, 46.46). Negaunee’s girls dominated with 125 points, well ahead of second place Westwood with 52. Iron Mountain picked up three individual wins as Taylor Talerico won both the 100 dash (12.91) and 300 hurdles (52.52), while Tiana Brooks won the 200 dash (29.58). Brooks also placed second in the 100 and third in the long jump. The Mountaineers also won the 400 relay in 54.03 with Talerico, Tiana Brooks, Kiera Bishop and Olivia Berutti. Iron Mountain competes Thursday in the Niagara Invitational.